This blog will feature posts on electronics and innovative products such as the Raspberry Pi. Linked website www.sf-innovations.co.uk. When putting together a Home Automation System together it is often necessary to gather analogue data. This could be from temperature / humidity sensors or to measure battery voltage. Often these are remote to the computing module which could be a Raspberry Pi, and Arduino or a PC - for example when gathering data from a weather station on the roof of a building. 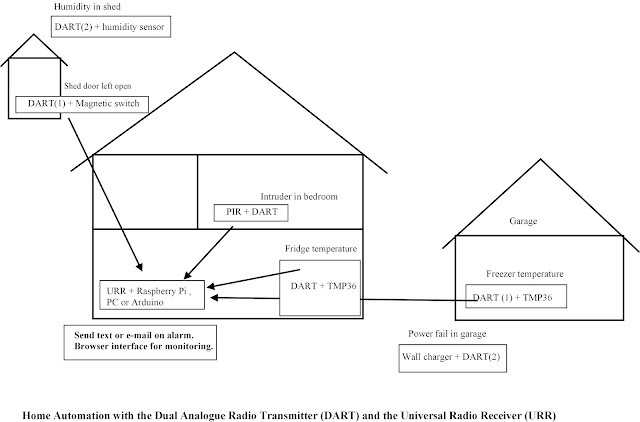 This example below shows how the DART and the URR could be used to gather useful information from around the home. 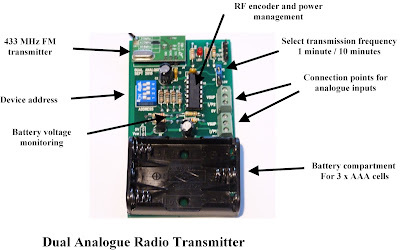 The Dual Analogue Radio Transmitter (DART) is a battery powered device using FM transmission at 433 MHz. This gives it superior performance to AM modules. The low power design enables the user to get nearly 18 months life out of 3 x AAA cells. The Universal Radio Receiver interface to a number of DART devices and outputs the received data out on a serial port, where it can be acted upon by a Raspberry Pi, a PC or an Arduino. In the above example, the DART in the garage is used to monitor the freezer temperature using a TMP36 measurement device which connects simply to the DART. The other (analogue) input of the DART is used to measure the voltage out of a charger. When there is power to the garage the DART sends out 255 and when there is no power it sends out 0. 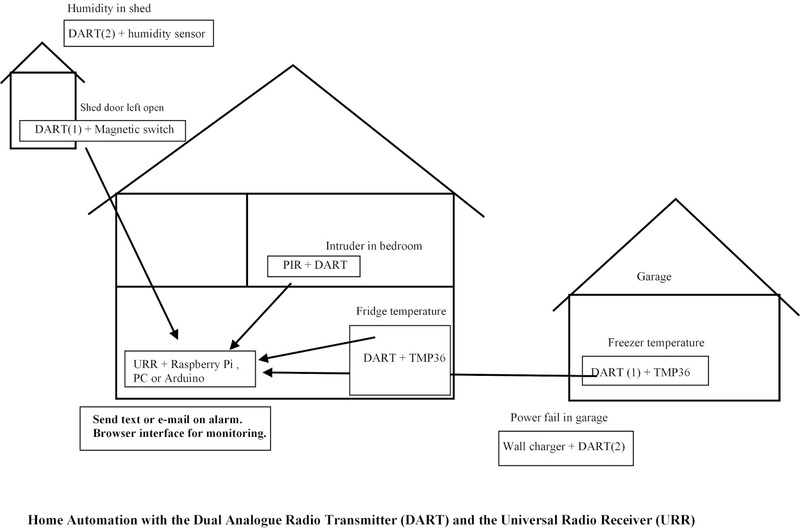 The drawing above shows other DART devices connected to monitor fridge temeprature, a PIR in the bedroom and humidity and door status in the shed. Click here for more information on the DART and the URR. These Radio devices using FM modules gives superior range and allows the user to monitor the status of various appliances around the home. If you like DIY projects go to https://github.com/smart-connected You will learn how to add raspberry pi to web platform.